Ten young members of our crew fully researched, wrote, produced and sourced the photographs for the the stories of the book. The crew had full press accreditation at the Games and were able to collect masses of unique journalistic material. The book was very much their work. The production and publication of the book were conducted by postgraduate publishing students from the University of Central Lancashire (UCLan). UCLan were another key partner of the Olympic Memorandum of Understanding between Pacific Oceania and the North West of England. The young crew enjoyed a unique experience being involved in the production of the book. 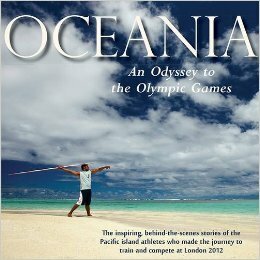 Proceeds of the book go to the development of sport in Pacific Oceania through ONOC. Each of our young young writers is now a published author. One of the most quoted and recognisable aims of the London Games was to ‘inspire a generation,’ in bringing this book to fruition, the young people involved in its creation have helped to fulfil that aim in a unique way. The book is available worldwide. Every International Olympic Committee was presented with a copy. Oceania Odyssey can be viewed on Amazon – hardback, paperback & Kindle. All proceeds return to Oceania to help to development of sport across the Pacific islands.